I was making dessert plans for our big Thanksgiving dinner and I ran across this recipe several times. It's pretty, has caramel and chocolate, and it's a bar so I decided to give it a try. I'm going to give you the recipe as I made it, but I'm also going to suggest a change with the crust. Place the flour, sugar and salt in a food processor and blend. 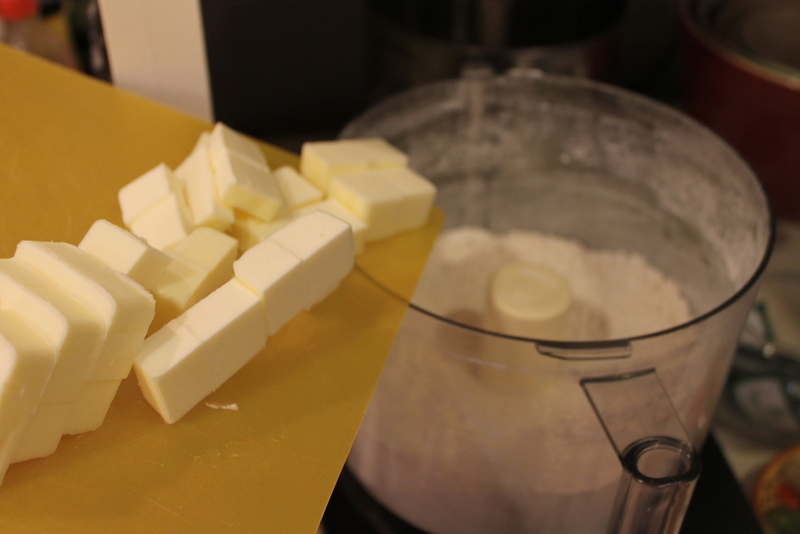 Add the 3/4 C cubed butter and process until it forms pea sized lumps. Sprinkle the mixture into a 10x15 inch baking pan that has been lined with foil and greased, and press the mixture down. Don't skip this foil part or you will have a tough time getting it out of the pan. Bake in a preheated 350F oven until golden brown, about 20 minutes then set aside to cool. That's what the recipe said to do, but next time I think i will melt the butter to make more of a cookie type dough to spread in the pan. It is so crumbly like this that it doesn't even stick to the filling in some places. Mix in the sugar, corn syrup and salt and bring to a boil. 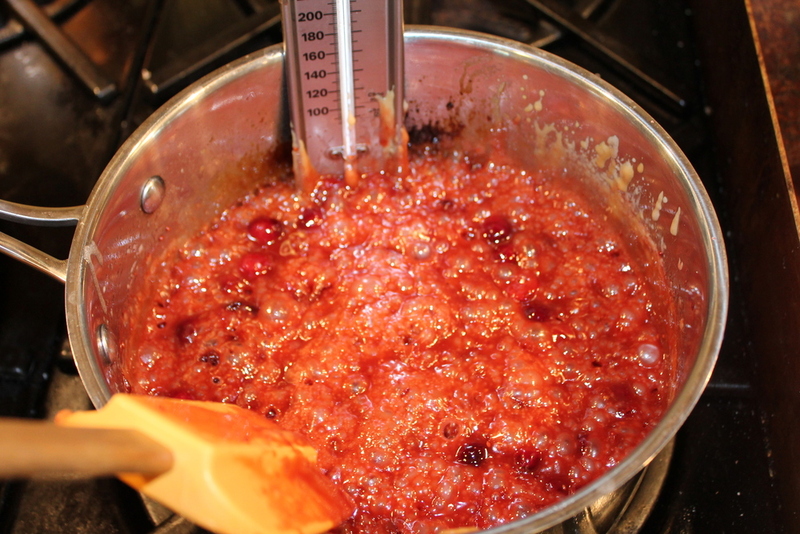 Simmer until the mixture turns a dark caramel color and the temperature reaches 245 degrees on a candy thermometer. This part always takes longer than I think it will, but keep stirring and be patient and it will get there. 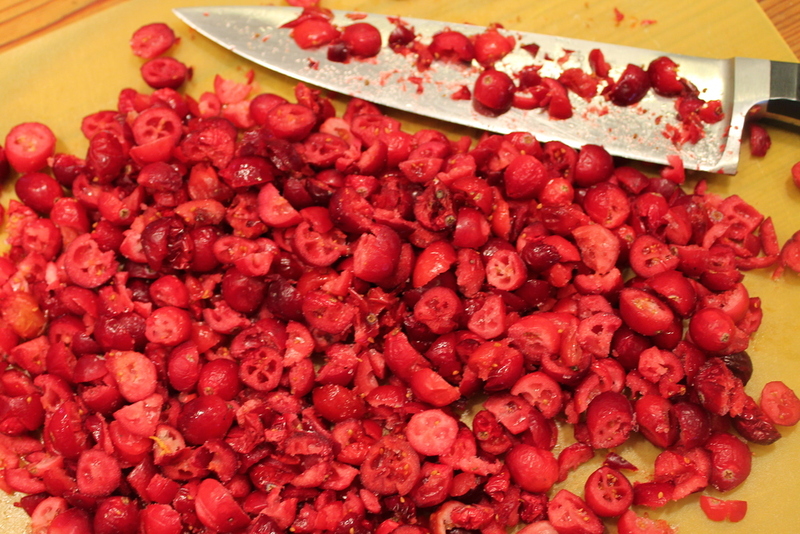 Mix in the chopped cranberries and return to 245 degrees. Again, this will take a while. Remove from heat and mix in the vanilla and pecans. Quickly spread the mixture over the shortbread crust and the let it cool completely. While the bars are cooling. Put a small handful of dark chocolate chips into a zip top bag and melt in the microwave, 30 seconds at a time, until soft. After the first 30 seconds, remove from the microwave and squish it around with your hands. If you still feel lumps, microwave it for another 30 seconds. Keep doing this until all the chips are melted. It shouldn't get too hot to handle so the chocolate won't scorch. Now cut a small piece of the corner of the bag off and squeeze the chocolate out onto the bars in a drizzle pattern. Refrigerate the bars for about 30 minutes so the the chocolate will set. Now cut the bars into 1" squares and remove from the foil and they are ready. These turned out to be really tasty. The cranberries added a nice tartness to the traditional turtle candy sweetness. They took a little time because of the caramel. but I will definitely be making them again. November 19, 2012 by Lynn Adams.